In a report announced August 30, INL’s nuclear experts, in collaboration with their counterparts at Argonne and Oak Ridge National Labs, presented pathways to deployment for advanced test and demonstration reactor concepts to support key national nuclear energy needs. This collective effort reflects the growing sense of urgency and the groundswell of support for developing advanced reactor technologies. The U.S. Department of Energy’s Gateway for Accelerated Innovation in Nuclear (GAIN) initiative directs the national laboratories to support industry efforts to deploy innovative nuclear technologies. Recently passed federal legislation that promotes innovation in technology and licensing also reflects broad bipartisan support for nuclear energy and the recognition that the nation’s energy, security and environmental goals cannot be met without it. The study relied on critical input from scientists and nuclear experts from across the DOE complex, academia and industry. This broad-based effort is focused on defining a path forward to providing reliable, efficient and clean nuclear energy using advanced reactor technologies. The current light-water reactor fleet provides nearly two-thirds of the nation’s zero-carbon energy. “The results of this study will help focus lab and industry resources on the most promising technologies and options for both near-term and long-term deployment,” said Dr. Hans Gougar, director of INL’s Advanced Reactor Technologies Division. Higher outlet temperatures to produce electricity more efficiently and to replace fossil-fuel-generated heat for industrial applications like chemical production and water desalinization. Enhanced inherent, or passive, safety systems to remove excess heat effectively even in the event of a full station blackout, such as occurred at Fukushima, and to allow the plant to withstand any conceivable accident scenario. Advanced fuels in various forms (liquid, particle, metallic or ceramic) and new cladding materials to operate at higher temperatures, extract more energy from the fuel, and tolerate a wider range of operating conditions. Advanced power conversion systems using gas turbines or supercritical fluids to reduce water usage and increase efficiency. The Advanced Demonstration and Test Reactor Options Study and its appendices are posted on INL’s Advanced Reactor Technologies website. Reflecting the growing sense of urgency and the groundswell of support for developing advanced reactor technologies, INL’s nuclear experts have teamed with their counterparts at Argonne and Oak Ridge National Labs to evaluate technologies and objectives for new test and demonstration reactors that will be critical for developing the replacements for our nation’s aging nuclear fleet. The study was led by Dr. David Petti of INL, Dr. Robert Hill of Argonne, and Dr. Jess Gehin of Oak Ridge and relied on critical input from scientists and nuclear experts from across the Department of Energy complex and industry. It reflects a renewed focus on collaboration between labs and industrial partners as they work to meet the challenges of providing reliable, efficient and clean energy to replace the aging light-water reactors that provide nearly two-thirds of the nation’s zero-carbon energy. The nation already has several highly capable test reactors, such as INL’s Advanced Test Reactor and the High Flux Isotope Reactor at Oak Ridge. But these reactors operate with a thermal or “slow” neutron spectrum not ideal for testing fuels and materials used in many of the advanced reactors that operate with a fast neutron spectrum. The renewed interest in fast reactors is based on the potential of such technologies to extract more energy from uranium, thorium and even spent fuel from existing light-water reactors. 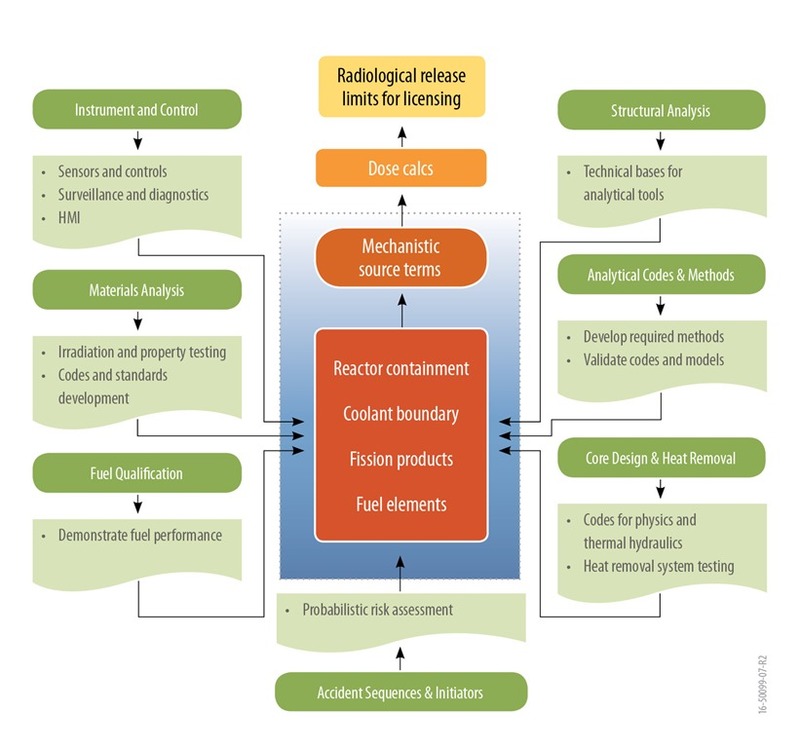 “In this study, we first identified the objectives for new materials testing and demonstration reactors, then we systematically evaluated the technologies available that will meet them,” said Hans Gougar, director of INL’s Advanced Reactor Technologies Division. Test reactors are complex and expensive national assets that are critical to the long-term development of the fuels and materials upon which future nuclear energy systems will rely. Higher outlet temperatures that can produce electricity more efficiently but can also replace the fossil-fuel-generated heat for industrial applications like chemical production and water desalinization. Enhanced inherent, or passive, safety systems that effectively remove excess heat even in the event of a full station blackout as occurred at Fukushima, allowing the plant to withstand any conceivable accident scenario. Advanced fuels in various forms (liquid, particle, metallic or ceramic) and new cladding materials that can operate at higher temperatures, extract more energy from the fuel, and tolerate a wider range of upset conditions. “The successful licensing and demonstration of any new nuclear plant concept will show not only that the U.S. still has the expertise but can also deploy an emissions-free, reliable energy source on a scale large enough to meet U.S. energy demands for the foreseeable future. It was therefore very important to take a very transparent and systematic approach to evaluating the available technologies and deployment pathways,” Gougar said.